Download "Topics: The Petroleum System. 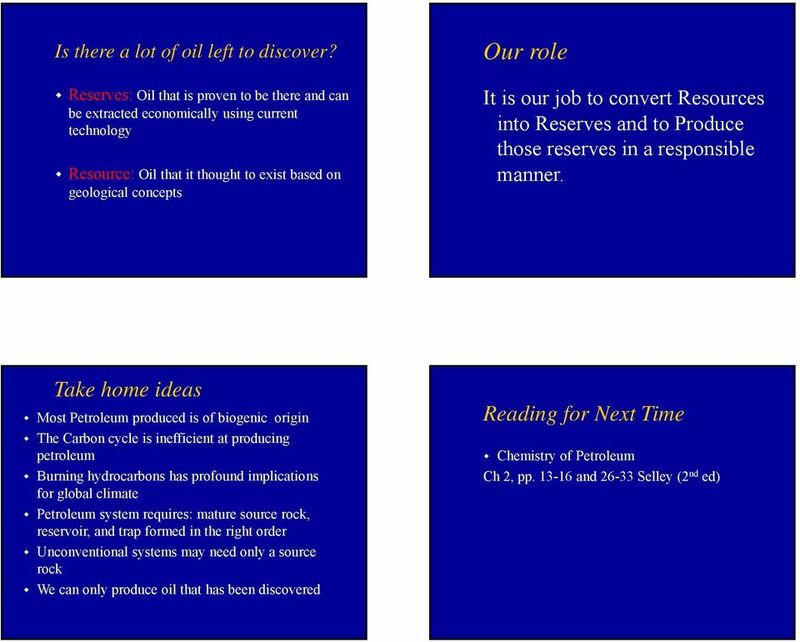 Origin of Petroleum. Arguments for biogenic origin. 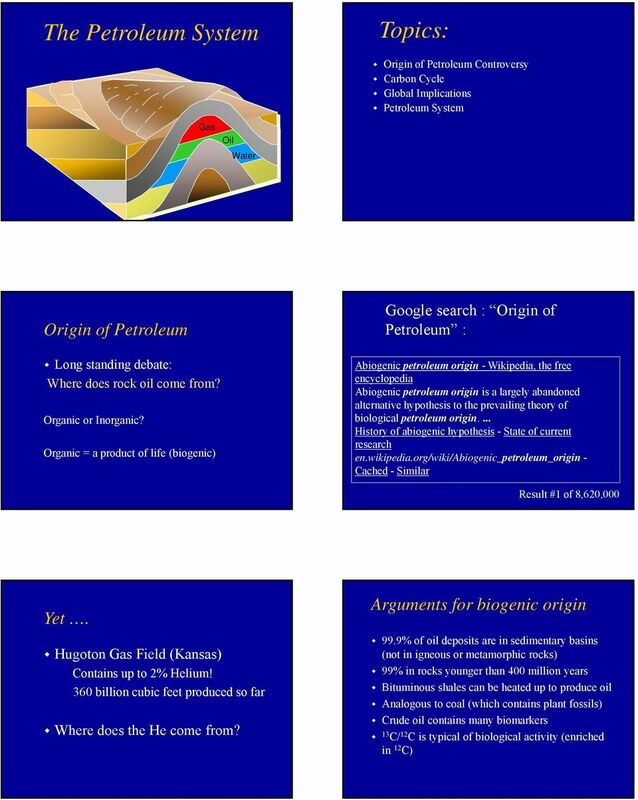 Google search : Origin of Petroleum : Hugoton Gas Field (Kansas)"
4 Conventional Petroleum System Factors required to make a conventional oil deposit A Sedimentary Basin with: Source rock- rich in organic matter Burial heating maturation Reservoir rock- porous and permeable Migration Path- source to trap Trap- structural trap stratigraphic trap Correct Timing Preservation Gas Oil Water Key Element: Source Rocks Black organic-rich marine shales Organic matter is preserved in low-oxygen water Restricted marine basins and zones were water rises from the deep John Armentrout 21 Exploration Pyramid Productive Field Discovery? Prospect Play Petroleum System Sedimentary Basin Unconventional Petroleum Systems Gas Shales Drill into the mature source rock and hydro fracture it (no trap or reservoir needed) Coal Bed Methane - Drill into a coal seam (source rock) and pump the water out to lower the pressure Tar Sands - Mine the tar-saturated sandstone and remove the oil with heat and solvents Oil Shale Mine the immature source rock and cook it Gas hydrates -??? Oil and Gas Terms. Anticline: An arch of stratified rock layers that may form a trap for hydrocarbons. Q1. In the carbon cycle the amounts of carbon dioxide and oxygen in the air are changed by several processes. 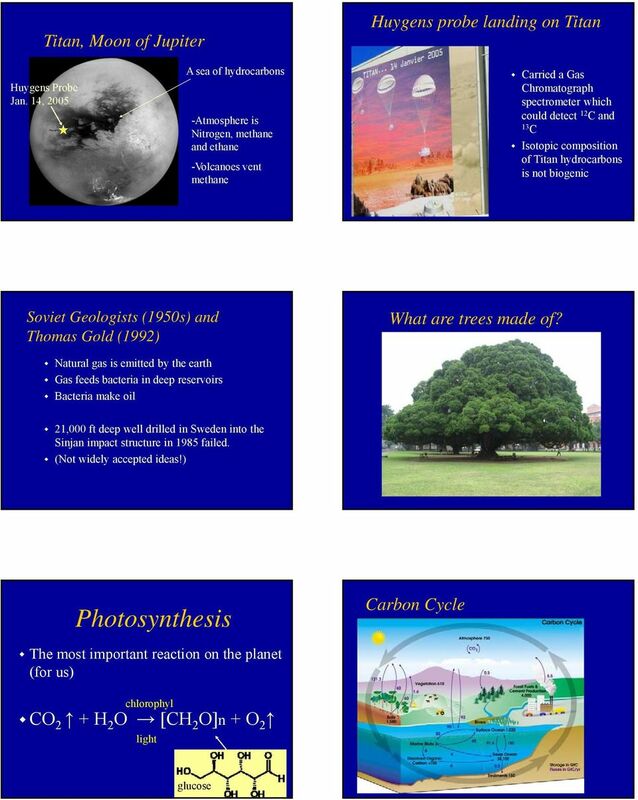 Study Guide for Energy and CO2 Management: Carbon Capture and Storage CO2 Science Jeopardy Answer No. 1: No. 2 is correct. Jeopardy Answer No. 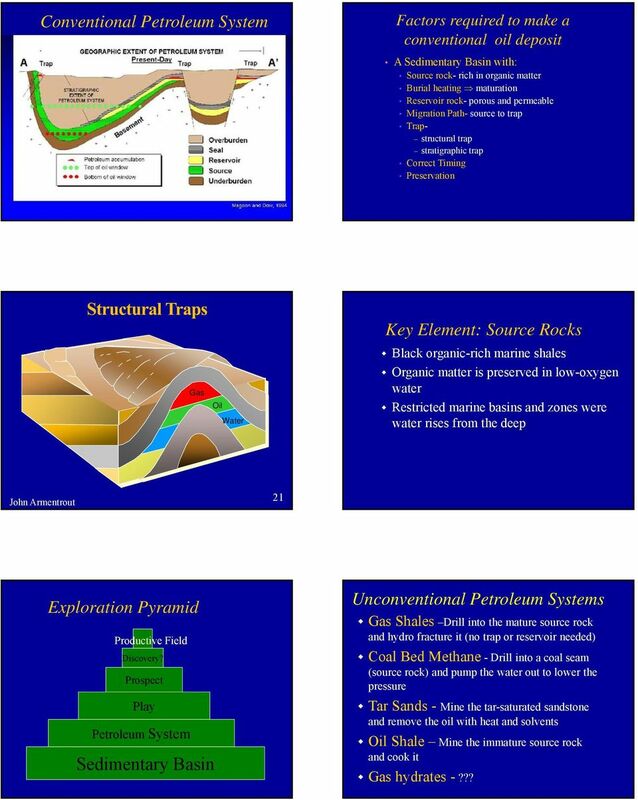 Introduction to Petroleum Geology I. The Basic Overview a. Petroleum Geology application of geology (study of Earth, materials and processes) to the exploration and production of oil and natural gas i.
Geothermal. . To reduce the CO 2 emissions a lot of effort is put in the development of large scale application of sustainable energy. WHAT HAS CHANGED RECENTLY TO MAKE THE MARCELLUS SUCH AN IMPORTANT FORMATION? Igneous rocks are the most common rocks on Earth 75 percent of the rocks exposed at the surface are sedimentary rocks. Geology Trail Stages 4-5 Student Activity Sheets Minerals are the building blocks of rocks and are made up of elements. They come in many different forms with some forming crystals with distinctive shapes. Match the term or person with the appropriate phrase. You may use each answer once, more than once or not at all. CARBON! What is it? Where is it found? How does it move? Rock Star 101. Introduction to Rocks. Geoscientists follow paths of exploration and discovery in quest of solutions to some of society's most challenging problems. 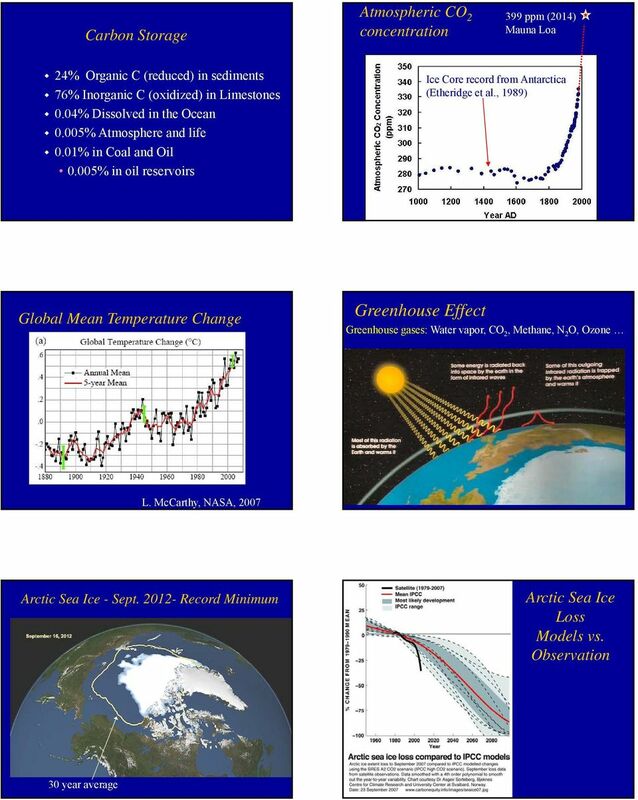 Environmental Science 101 Energy Fall 2012 1 Lecture Outline: 7. NON-RENEWABLE ENERGY RESOURCES A. Energy Sources and Uses in USA B. Current Consumption, Uses and Costs 1. Consumption 2. Energy Costs C.